The tasks involved in industrial process dosing are very diverse, but they all have one thing in common: high precision requirements. These requirements have to be fulfilled regardless of environmental influences. Bürkert now presents a new pneumatic system as a compact solution for this purpose. Bürkert’s patented pneumatic dosing system for fluids can be used in all applications that require dosing of defined sample quantities with maximum repeatable accuracy. Examples of dosing applications include vaccines, chemicals in industrial washing machines, flavourings in the beverage industry, pharmaceutical raw materials and dosing tasks in filling machines. 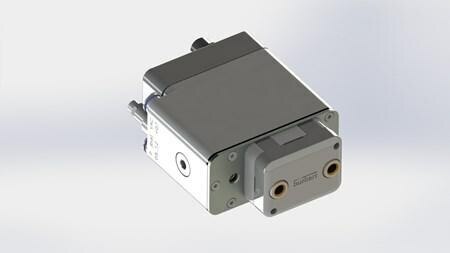 The high precision is made possible by the use of pneumatics. The dosing system is actuated by means of pressure and vacuum, which provide substantially more power than conventional actuating systems. This power makes it possible to control the defined dosing quantity with a precision of ±2 %, largely independent of temperature and viscosity. The size of the dosing chamber defines the dosing volume per stroke. It can be between 150 and 750 μl. The system, which features a high level of flexibility and numerous options for adaptation, consists of a controller and an exchangeable dosing chamber, which can either be attached to the controller or positioned freely. The dosing chamber consists of two mediacontacting components, a plastic housing and a separating membrane. The use of highquality materials such as PEEK and FKM or FFKM also makes it possible to convey very aggressive media. The chamber is self-priming and easy to flush. The controller supplies the membrane above the chambers alternately with either pressure or vacuum. This conveys a pre-defined quantity of media through the dosing chamber. Media can be conveyed in both directions. This makes the recovery of expensive media, for example, as well as mixing processes possible. Due to the separation of the controller and dosing chamber it is easy to replace the chamber. For single-use applications the dosing chambers are made of inexpensive materials. Depending on requirement, the are also available in sterile versions. The controller of the pneumatic dosing system contains the on/off valves and the electronics. The system requires external compressed air. In the case of unpressurised media, vacuum must also be supplied. On request, the controller is also available with a completely integrated pressure and vacuum supply.